conventions and embracing agriculture, vegetable farming and aquaculture. Three decades on, trends have reversed and there’s no shame in picking up the plough. A growing breed of youngsters—armed with professional degrees and successful enterprises—are proving that their degrees are assets out in the field. 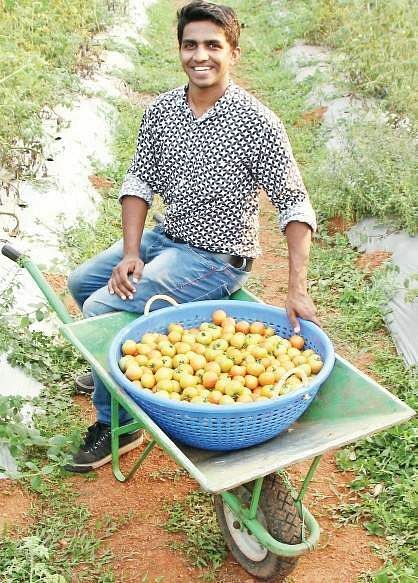 From using lessons in mechanical engineering to mechanise farms and creating e-commerce websites to sell organic farm produce, these youngsters are proving that careers can be created away from the confines of a cubicle. peanut fodder for increasing soil nutrients the organic way. When the 2009 recession hit, 37-year-old Digol Thomas realised it would be wise to rely on ones backyard rather than some unforeseen global economic forces. This marked the engineering graduate’s venture into farming at Manathavadi, Wayand. “I started out with bitter gourd, which is relatively easily to cultivate. Initially, a few of my bitter gourds wilted, and every one opined it was a nematode attack (a soil-bourne plant disease). But I posted pictures of the vegetables on Facebook and some farmers hinted it maybe an iron and magnesium deficiency. Digging up the roots confirmed the same and I was able to salvage the situation with basic manure,” says Thomas, who now specialises in identifying plant diseases under the brand name, Avani.